I received a lovely package yesterday from Hofficraft on Etsy. As regular readers will know, I love anything whimsical and foresty. Anything wildlife themed, I adore! 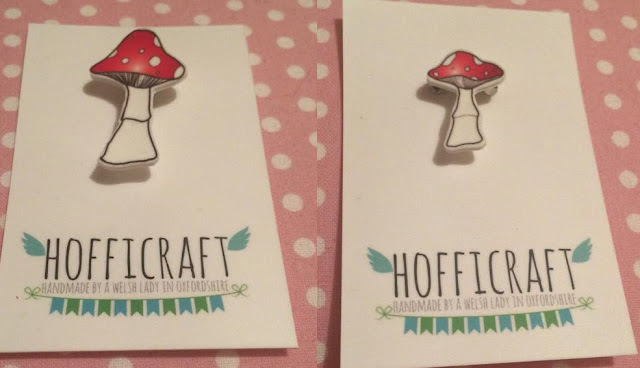 Hofficraft sells lots of cute things such as cute illustrated badges made from shrink plastic. There's an actual leek with a little face which is the cutest thing in the world ever. I think everyone needs a little leek badge. In all serious though, the badges are all original illustrations which have been scanned, digitally coloured then printed to shrink plastic. They are then hand cut and varnished before being mounted to the actual pin. So there's quite a bit of craftsmanship involved here! They're all so perfect looking too, so it surprised me a little that they are hand cut. So I received two different toadstool badges which I swiftly pinned on to my bumble bee print parka by Henry Holland. They look perfect on there like they're growing! 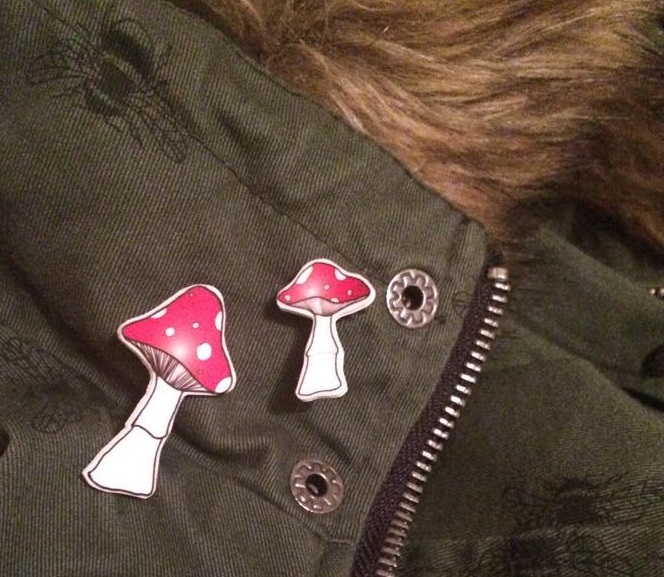 I absolutely love my little toadstool badges.. I love mushrooms as you are aware - my first tattoo was a mushroom as they're just so cute. Finding beauty in nature is the best.......well.. these products definitely must be cute if they've sent me into a waffle about nature! 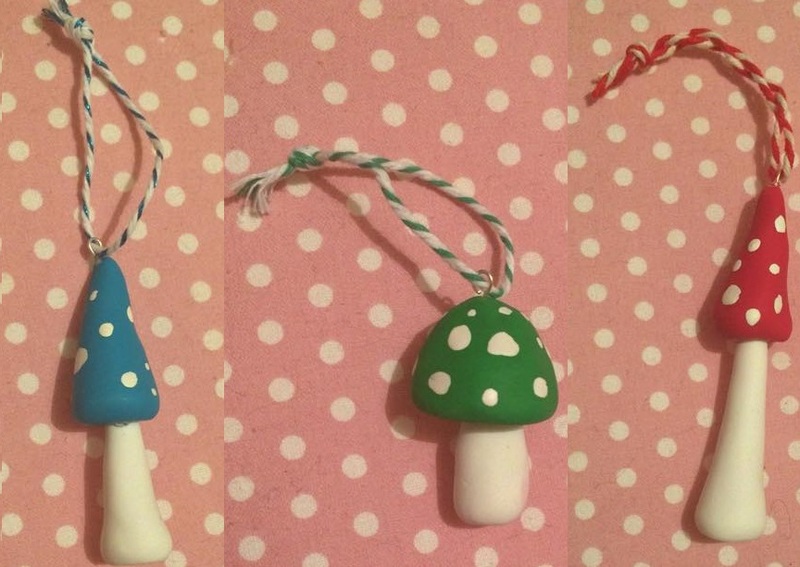 In the little chevron bag inside the package there were also three beautifully wrapped fimo toadstool decorations. By this point I was in a cute coma, everything is gorgeous. These toadstools are completely unique as they are hand molded before being baked in a hot oven. When they're all cool, they're glued and painted with little white enamel spots before a silver hook is added and some lovely twine is threaded through so it can be hung up to make any space look pretty. So I received a red one, a green one and a blue one. I love how the twine even matches the toadstool colour - the stripy twine is really cute. I love these decorations and they feel really substantial. 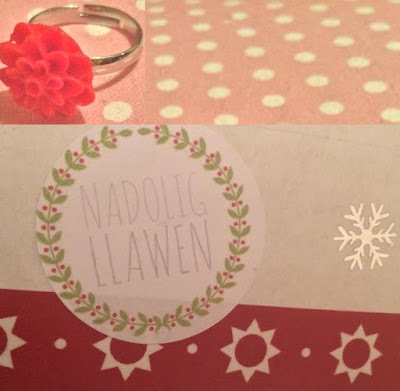 The final thing that I opened was a little ring with a red flower on it which is very cute. I love everything that I received in my lovely package. Everything was packaged up in cute little bags with stickers on there and the box was covered in little metallic snowflakes. I'm so pleased with everything about Hofficraft. I highly recommend that you check the shop out, there's so much variety there and everything is so perfectly made that you cannot go wrong.